Stitched on 32 ct linen that I stained for an olde time look and used over dyed floss. I did change the word in the design from Needles to Autumn, so that I could use it to decorate in the fall. That is so pretty! 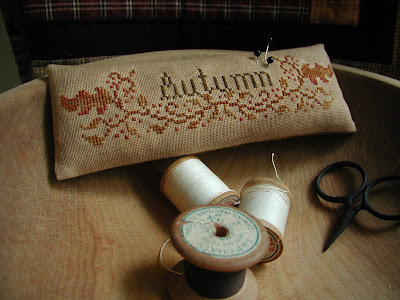 I love autumn and love the design with "autumn" stitched. May have to borrow this idea. I would love to know how you dyed this linen. Would you be willing to share your know how on dying. I have been researching doing dying. Any info would be helpful. I love your Autumn design you stitched. So pretty !! J'adore cette saison, avec toutes ces couleurs!!! Which dyed floss you have used? I used the recommended WDW floss and soaked the linen in a mixer of dark molasses, cinnamon and water before stitching. I dry it in a 200 degree oven. Check it often. After it's all stitched I further antique it with Distress It, by Hooked on Rugs, using a stiff paint brush. I lightly brush it on and let it air dry. Be careful with the distress it when using hand dyed floss. If you get it too wet on certain color floss, it will run. I have had this happen with turkish red and swamp water, both by WDW. Hope this helps. Thanks for the questions, always glad to pass on tips.